The BBC News website’s efforts to promote the topic of last weekend’s donor conference in Cairo were evident before, during and after the event. On October 11th – the day before the Cairo conference – an article by Yolande Knell titled “After Gaza war, Palestinians seek new path to statehood” appeared in the ‘Features & Analysis’ section of the website’s Middle East page. 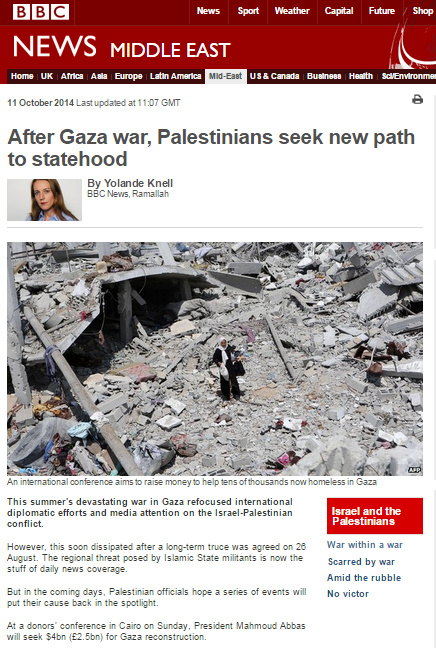 Roughly half of Knell’s article is devoted to amplification of the PA’s various current unilateral strategies, with her closing sentences so encumbered by redundant understatement that they fail to inform readers of the true significance and implications of the PA’s breach of its existing commitment to a negotiated solution to the conflict in favour of additional headline-grabbing unilateral moves. “The Palestinians know that their latest plan to return to the Security Council, which has been criticised by Israel, is very likely to fail. However, they hope for a show of support for statehood. A draft resolution calls for an Israeli withdrawal from all occupied territory by November 2016 and for an international presence in East Jerusalem to protect the Palestinian population. The Palestinian back-up plan is to sign the Rome Statute of the International Criminal Court to pursue legal action against Israel. Knell’s characterization of the PA’s attempts to bring about externally imposed actions rather than negotiated agreements as merely “unlikely” to bring about an end to the conflict is clearly absurd. Notably, she fails to make any mention of the fact that one partner in the current PA unity government – Hamas – refuses to recognize Israel’s right to exist and is not a member of the body with which Israel negotiates – the PLO. No less remarkable is her earlier misrepresentation of an existing construction project in the Jerusalem district. “But in the coming days, Palestinian officials hope a series of events will put their cause back in the spotlight. At a donors’ conference in Cairo on Sunday, President Mahmoud Abbas will seek $4bn (£2.5bn) for Gaza reconstruction. A day later the British parliament is scheduled to hold a non-binding vote on whether the government should recognise Palestine as an independent state within the boundaries of the ceasefire lines which existed prior to the 1967 Middle East war. Later this month there is a plan to ask the United Nations Security Council (UNSC) for recognition and to set a deadline for Israel to pull out from occupied Palestinian territory. The latter two steps are likely to be little more than symbolic but the Palestinians hope to increase political pressure on Israel, which has recently continued to expand its settlements in the West Bank and East Jerusalem. 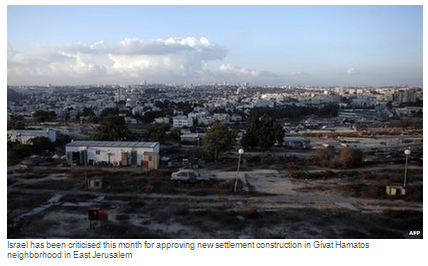 Seeing as it already reported on the same planning application in 2012, the BBC should be aware of the fact that there is nothing remotely “new” about the plan to build housing in the Givat HaMatos district of Jerusalem. Knell, however, refrains from informing readers that the neighbourhood was the site of temporary housing for new immigrants from the former USSR and Ethiopia from 1991 onwards. She neglects to state that initiatives to replace caravans with proper housing were first proposed nine years ago and that the plans approved by the district planning committee in late September allocate around half of the planned apartments to Arab residents of nearby Beit Safafa – which itself straddles the 1949 armistice line and yet of course is never referred to by Knell and her colleagues as a “settlement”. Had she made sure to accurately and impartially inform BBC audiences of the above facts, Knell would of course have found it rather more difficult to make use of the BBC’s misleading standard editorial guideline breaching insertion “Jewish settlements are considered illegal under international law, though Israel disputes this”. The Givat HaMatos project is not a “Jewish settlement” but a planned mixed neighbourhood of Jerusalem in an area which would remain under Israeli control according to any realistic scenario of a negotiated two-state solution. In other words, Yolande Knell has once again ditched her commitment to the BBC’s supposed editorial standards of accuracy and impartiality, as well as her obligation to enable audiences to reach an “understanding” of international issues, in favour of exclusive amplification of the PA’s political narrative. Israel already has a 27% Arab population and its 865,000 Jews expelled to make the Arab states Jew free could be replaced by the Palestinian refugees. Emanuel – the Arab population is 20.7% not 27%. Non-Arab, non-Jewish 4.2%.